It’s the first day of June! Can you believe we are half a year already??!! Summer is practically knocking on our door. And as the temperatures start to rise, we start shedding those wintery layers. But not all layers are made for the cold! Playing with light fabrics creates an easy breezy summer look, like the one I wore this weekend. 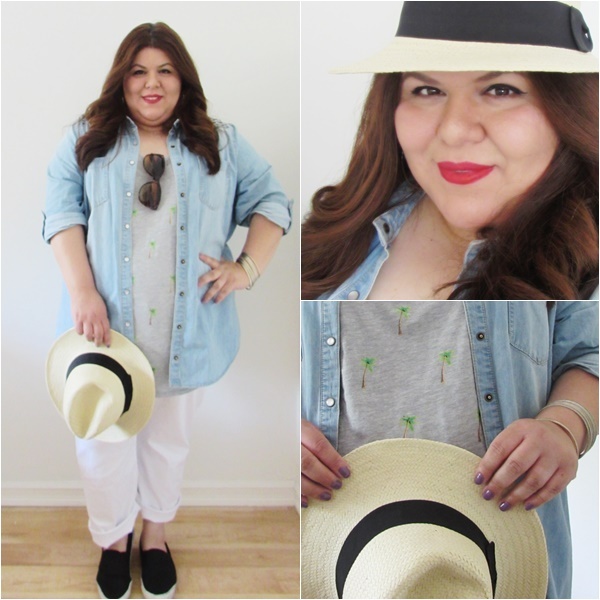 I paired my favorite chambray shirt with white cuffed boyfriend jeans, a palm graphic tee, and topped it off with straw fedora. The outfit was airy enough to keep me cool and provided plenty of protection from the beaming sun. Super chic look Jenny! This is the perfect casual day look.